At our house Chicken Fingers must be served with mashed potatoes! This is not diet food, but it sure is good! 1. In a small cup or bowl, combine the seasoned salt, paprika, and pepper. 2. Clean the chicken breasts, removing any fat and gristle. Cut each breast half into 3 or 4 long strips and place in a glass bowl. Lightly season the chicken with about a third of the seasoning mix, toss to coat, and let stand a few minutes. 3. Pour the buttermilk over the chicken and toss to coat. Refrigerate one hour or longer. 4. In another shallow baking dish, combine the flour and the remaining seasoning mix. Remove the chicken from the buttermilk, reserving the buttermilk, and add to the flour mixture. 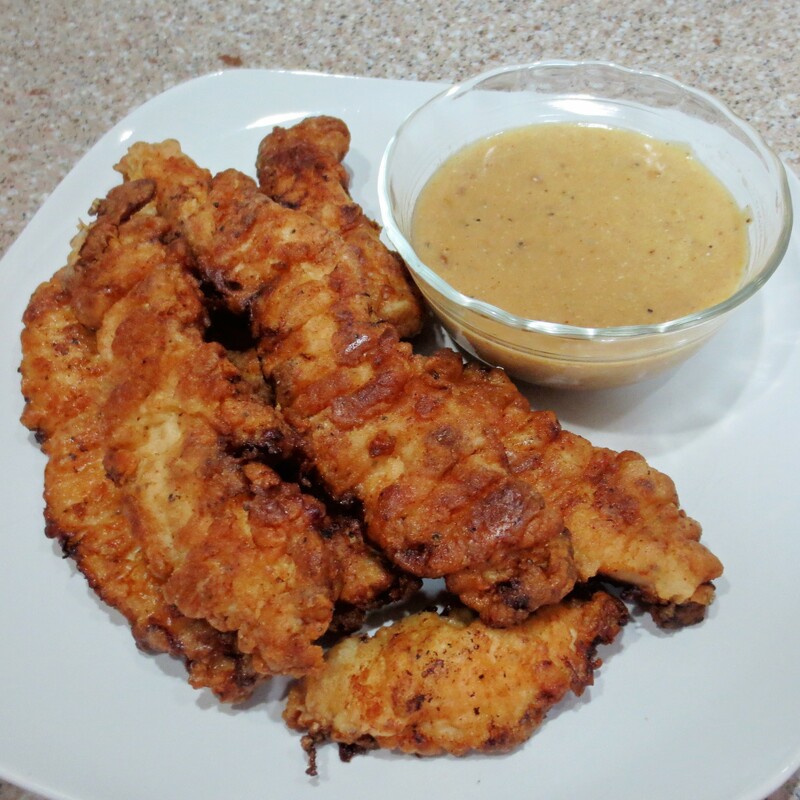 Coat the chicken strips in the seasoned flour and place on a wire cooling rack for 15 minutes to set the crust. Reserve the flour mixture. 5. Preheat the oven to 200°. Place another wire rack on a baking sheet in the oven. 6. Meanwhile, heat the shortening in a 10-inch skillet. When hot enough the shortening will appear slightly wavy. 7. Carefully slide the chicken strips a few at a time into the fat and fry, turning once, until cooked through and golden brown. (Gently tease the chicken fingers with tongs.The chicken will easily release from the bottom of the pan when ready to turn. If the breading sticks to the pan, just wait and check again.) Remove the chicken from the pan to the other wire rack and keep warm in a 200° oven. 8. Drain all but 3 tablespoons of shortening from the skillet. Add the minced onion to the skillet and cook, stirring often, until softened. 9. Stir 1/4 cup of the reserved flour mixture into the skillet, blending well, and cook over medium low heat for one minute. Whisk in the chicken broth a little at a time, then stir in the reserved buttermilk. Bring the gravy to a boil and cook, stirring constantly, until the gravy is thickened. 10. Serve the gravy in small bowls for dipping and ladled over mashed potatoes.